On the heel of its Snapdragon 855 SoC announcement, Qualcomm announced the new Snapdragon 8xc SoC designed for Windows laptops. Qualcomm and Microsoft first demonstrated Windows being emulated on an ARM processor back in 2017. The companies said that the key goal is to drastically enhance battery life in devices designed for surface level workers. In addition, its integrated LTE modem enables an always-on environment, an important feature for users who do remote work. Efficiency mattered, but the Snapdragon 850 had subpar performance in many Windows apps, which meant it was a ways away from being adopted for mainstream use. Such was expected as the x86 instructions needed to be translated into RISC instructions before the ARM processors could handle them. 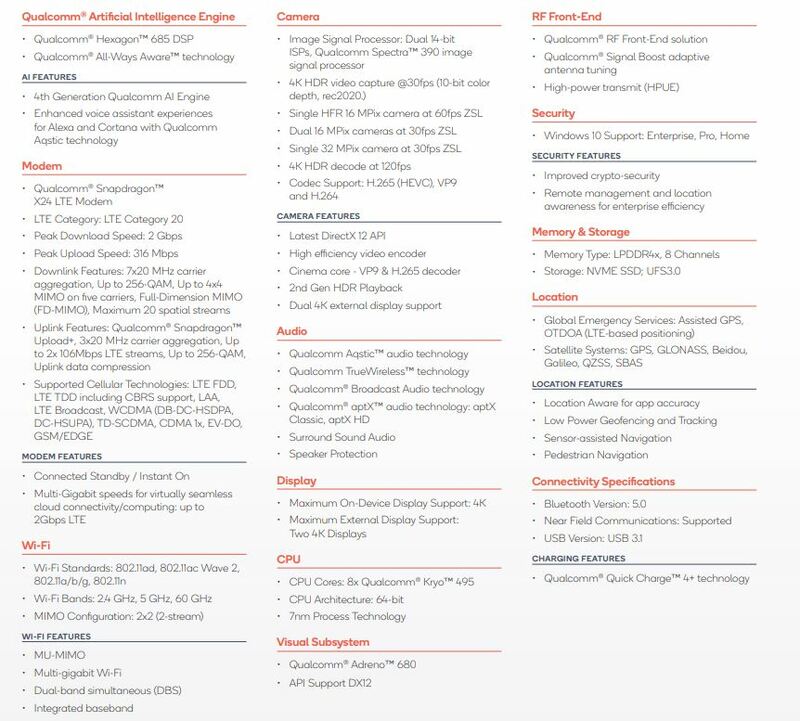 The new SoC is part of the Qualcomm Snapdragon family populated mostly by its SoCs designed by mobile. The new chip, however, is built from scratch to cater to Windows devices. As with the recently-released Snapdragon 855, the Snapdragon 8xc is built using 7nm FinFET transistors. Instead of using the Snapdragon 855’s Kryo 485 compute cores, the Snapdragon 8xc has eight brand-new Kryo 495 cores. The Kryo 49 cores are based on an ARM core variant, and Qualcomm claims that it’s the “fastest in a Snapdragon yet”. The GPU has been beefed up as well. Going by the naming scheme alone, the Adreno 680 should indicate a major leap from the Adreno 640 on the Snapdragon 855. It fully supports desktop APIs like DX12 and can supposedly drive two 4K monitors simultaneously. Qualcomm claims that the new GPU provides twice the performance and 60 per cent more power efficiency compared to the previous generation Snapdragon 850. Alongside the new CPU and GPU is the new Hexagon 685 DSP. This co-processor is designed to handle machine learning workloads and help improve AI functions. It’s also the component that handles security. Interestingly, its name suggests that it’s a lower-tiered chip compared to the Hexagon 690 on the Snapdragon 855. Always-on connectivity is handled by the integrated X24 LTE cat 20 modem with a 2Gbps max throughput. Note that this is a premium 4G LTE modem, and doesn’t support 5G. This time around, Qualcomm also placed emphasis on security for enterprise. It now carries full hypervisor support, protected LTE connectivity, improved cryptosecurity, and certified for Windows 10 Enterprise. This should help to push the Snapdragon 8xc into businesses that need a power efficient, always-on device. The Qualcomm 8xc will exist alongside the previous-gen Snapdragon 850 as a more powerful option. Qualcomm hasn’t announced what devices will use the Snapdragon 8xc. In its product video, however, it showcased a few form factors that it could be applied to, including a dual-screen book-like device and a folio-like foldable device. Prominent Qualcomm laptop partners include Samsung, Asus, and Lenovo.